Originally published as Greek Coins in North American Collections, Ancient Coins in North American Collections (ACNAC) systematically describes and illustrates ancient coins in significant private and institutional collections and is intended to record collections of numismatic value which are not readily accessible or are likely to be dispersed. This series conforms to the general format of the Sylloge Nummorum Graecorum fascicules in placing emphasis on the reproduction of the coins and limiting the text to basic numismatic data. References and dates are given only when there has been a thorough mint study of a particular coinage. Earlier publications of individual coins have been noted in some cases but no comprehensive search of sale catalogues has been undertaken. All weights are in grams, and all coins are silver unless otherwise indicated. 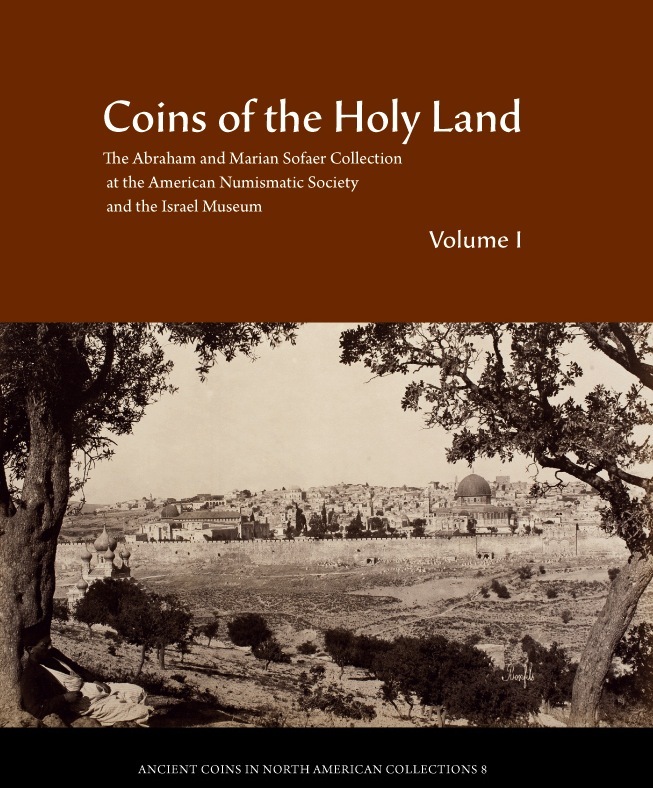 Coins of the Holy Land: The Abraham and Marian Sofaer Collection at the American Numismatic Society and the Israel Museum (Ancient Coins in North American Collections 8, 2013) by Ya’akov Meshorer with Gabriela Bijovsky and Wolfgang Fischer-Bossert, and edited by David Hendin and Andrew Meadows. The Abraham and Marian Sofaer collection consists of 4,000 coins and related objects produced by the peoples who inhabited the Holy Land from the Persian period in the 5th and 4th centuries BCE through the Crusader Kingdom in the 13th century of the modern era. Assembled over more than 30 years, the collection contains gold, silver, and bronze coins of the Persians, Greeks, Samarians, Jews, Nabataeans, Romans, Byzantines, Arabs, and Crusaders. Coinage of the Caravan Kingdoms: Ancient Arabian Coins from the Collection of Martin Huth (Ancient Coins in North American Collections 10, 2011) Built over the last 20 years, the Martin Huth collection of pre-Islamic coins covering all parts of the Arabian Peninsula represents the largest assembly of such material ever put together, exceeding by far the holdings of existing Museum collections. 480 coins are fully described and illustrated on more than 70 plates. Troxell, Hyla A. 1969. The Norman Davis collection. Ancient Coins in North American Collections 1. New York: American Numismatic Society. Herbert, Kevin. 1979. The John Max Wulfing collection in Washington University.Ancient Coins in North American Collections 2. New York: American Numismatic Society. Bishop, J. David and Holloway, R. Ross. 1981. Wheaton College collection of Greek and Roman coins. Ancient Coins in North American Collections 3. New York: American Numismatic Society. Houghton, Arthur. 1983. Coins of the Seleucid empire from the collection of Arthur Houghton. Ancient Coins in North American Collections 4. New York: American Numismatic Society. Waggoner, Nancy M. 1983. Early Greek coins from the collection of Jonathan P. Rosen. Ancient Coins in North American Collections 5. New York: American Numismatic Society. Mildenberg, Leo and Hurter, Silvia. 1985. The Arthur S. Dewing collection of Greek coins. Ancient Coins in North American Collections 6, v. 1. New York: American Numismatic Society. Mildenberg, Leo and Hurter, Silvia. 1985. The Arthur S. Dewing collection of Greek coins. Ancient Coins in North American Collections 6, v. 2. New York: American Numismatic Society. Herbert, Kevin; assisted by Keith Candiotti. 1987. The John Max Wulfing collection in Washington University: Roman republican coins. Ancient Coins in North American Collections 7. New York: American Numismatic Society. Hoover, Oliver. 2007. Coins of the Seleucid empire from the collection of Arthur Houghton. Part II. Ancient Coins in North American Collections 9. New York: American Numismatic Society. Huth, Martin. 2011. Coinage of the Caravan Kingdoms: Ancient Arabian Coins from the Collection of Martin Huth. Ancient Coins in North American Collections 10. New York: American Numismatic Society. Meshorer, Ya’akov; with Gabriela Bijovsky and Wolfgang Fischer-Bossert. 2013.Coins of the Holy Land: The Abraham and Marian Sofaer Collection at the American Numismatic Society and The Israel Museum. Volumes 1 and 2.Ancient Coins in North American Collections 8. New York: American Numismatic Society.